Another popular question on these ‘Getting to know you’ things is; What was the first album you ever bought. I don’t actually know the answer to that question, but I’m sure it wasn’t a spice girls album. Nope. Definitely not. As parents you have many firsts. Kids first tooth. Kids first word. The first time your kids farts and giggles at himself…..Is that just me? Oh! Well recently, we had another first. After 20 months BB finally had his first hair cut. 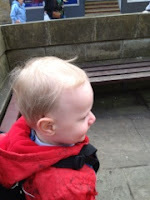 We were not sure how he would react to having to sit still and for a stranger to be snipping at his hair. 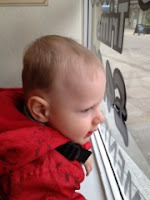 But as with most things, he seemed to just take it in his stride. Never moved a muscle, whined or tried to get out of the chair. It was yet another moment where I was brimming with pride and even the other people in the barbers commented on how well behaved he was. THAT’S MA BOY! 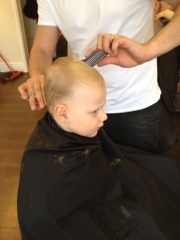 How did your little ones first hair cut go? Have you had any firsts recently? I’m already looking forward to my our next one!